]n appendectomy is an emergency surgical procedure to remove an inflamed or infected appendix, a condition known as appendicitis. Without surgery, the appendix can rupture, spilling infectious material into the bloodstream and abdomen, which can be life-threatening. The diagnosis of appendicitis is usually made based on the patient's condition, blood tests, and a CT scan. Once diagnosed, the surgeon will explain the surgery in detail, including a description of the procedure, the risks of surgery, and a typical recovery from surgery. There is no alternative treatment for appendicitis—surgery is considered the only way to treat it. Some facilities are doing medical research into treating appendicitis with antibiotics. The staff will initiate an IV and may shave the abdomen of male patients to allow for a cleaner incision. If the patient has been suffering from nausea and vomiting, which is common with appendicitis, medication will be given to treat the symptoms. Pain medication can also be given, along with IV fluids if the patient is dehydrated. Antibiotics may be initiated prior to the surgery or may be started at the end of the procedure. The patient will then be transported to the operating room and assisted onto the operating table, where the staff will prepare the patient’s skin for surgery. The skin is swabbed with a solution that kills germs to help prevent infections along the incision. Once the skin is prepared for surgery, the staff will cover the patient with sterile drapes to keep the area as clean as possible during the procedure. The anesthesia provider, typically an anesthesiologist or a nurse anesthetist, will begin the surgery by giving a sedative by IV to relax the patient. Once the patient is relaxed, a breathing tube, or endotracheal tube, is threaded through the mouth and into the windpipe before being connected to the ventilator. The breathing tube is necessary because general anesthesia causes paralysis in addition to rendering the patient unconscious. While paralyzed, the patient cannot breathe without assistance and depends upon the ventilator to supply air to the lungs. Once the anesthesia has taken full effect, the surgeon can begin making the incision, without the patient feeling pain or waking. During the surgery, the patient will be closely monitored by the anesthesiologist, with the vital signs being observed throughout the surgery and medications given as needed. During the traditional, or open, appendectomy procedure, an incision two to three inches long is made in the right lower abdomen several inches above the hip bone. The incision opens both the skin and divides the abdominal muscle tissue, allowing the surgeon to see the appendix and pull it closer to the surface for better access. Once the appendix is identified, it is cut away from the surrounding tissue, including the intestine, and infected tissue is removed. The opening that is left after the appendix is removed is closed by surgical staples or by sewing the area closed. The appendix and surrounding tissues are then closely inspected to make sure the infection is isolated to the tissue that has been removed. If necessary, the surgeon can use sterile fluid to wash the area and then suction out any evidence of pus. If the surrounding tissues are healthy, the surgeon can begin to close the incision by first sewing the layers of muscle together, then closing the skin with stitches or staples. The incision will be covered with a sterile bandage to protect the skin and prevent infection. The procedure, from the initiation of anesthesia to bandaging, takes less than an hour if there are no complications. The laparoscopic appendectomy is very similar to the traditional open procedure with one major difference: Instead of one incision 3-5 inches long, there are several incisions half an inch long. It is through these tiny incisions that the surgeon works, inserting a camera through one incision and tiny instruments through two or more additional incisions. The surgeon then works by watching the video taken by the tiny camera. The surgeon identifies the appendix and then separates the good tissue from the bad by either cutting the appendix away, creating a line or sutures or by using a line of staples. The appendix is placed in a sterile bag that is pushed through one of the incisions before being removed. This is to prevent any pus or infectious material inside the appendix from leaking into the abdomen. The appendix and surrounding tissues are then closely inspected. This is to make sure that only healthy tissue is left behind and to make sure that the suture/staple line is perfect. If necessary, such as in the event of a ruptured appendix, the surgeon can use sterile fluid to wash the area and then suction out the infectious material. Then, if the surrounding tissues are healthy, the surgeon can close the incisions, typically with small sticky bandages called steri-strips or a sterile bandage to protect the skin and prevent infection. The entire procedure, if there are no unexpected complications, usually lasts between 45 minutes and an hour. Once the incision is covered, the anesthesia will be stopped, allowing the patient to slowly begin to wake and the breathing tube to be removed. The patient will be transferred to the Post-Anesthesia Care Unit to be monitored by nursing staff. The patient will be groggy at first, and will then slowly become more alert as the anesthesia wears off completely. During the post-anesthesia phase, vital signs will be monitored closely for any possible complications and pain medication given when necessary. Once completely awake, the patient will be transferred to a hospital room to begin healing. Most patients have a notable decrease in pain after surgery, even with the pain of the incision. The next day, the patient may begin taking small sips of clear fluids and then progress to a regular diet if the fluid is tolerated. Sitting up on the edge of the bed, then walking short distances, will be encouraged several times a day. Medication will be available to make movement less painful. 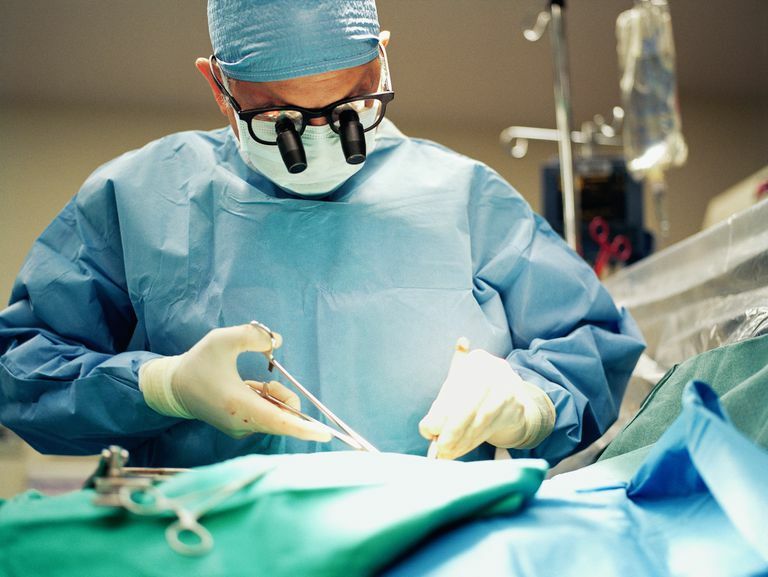 Most patients are discharged within 24 hours of surgery to continue recovering from surgery. The incision is usually held closed with small strips of adhesive that will slowly fall off as the patient showers and goes about their normal activities. Internal sutures will slowly dissolve and do not need to be removed. Some patients may need a mild pain medication during this part of recovery, and most will continue to take antibiotics for up to a week after surgery. Most patients are able to return to normal activities within a few weeks; more strenuous activities may take a week or two longer.